American Outdoor Grill T-Series 24-Inch Grill On Pedestal With Rotisserie:The American Outdoor Grill post model collection is designed for long-lasting; unsurpassed performance that produces unbelievable flavor. All AOG pedestal grills may be bolted to a deck or concrete slab; and are optimized for parks; condominiums; apartments; and anywhere else where space is a premium. American Outdoor Grill T-Series 24-Inch Grill On Pedestal With Rotisserie:The American Outdoor Grill post model collection is designed for long-lasting; unsurpassed performance that produces unbelievable flavor. All AOG pedestal grills may be bolted to a deck or concrete slab; and are optimized for parks; condominiums; apartments; and anywhere else where space is a premium. Furthermore; AOG pedestal grills feature a built-in safety timer that automatically shuts the gas off after three hours. Alongside the rest of the AOG line; they boast a stylish; sleek appearance; including the beautiful double-layered satin finish hood; stainless steel construction; and custom-designed analog thermometer with polished bezel. Proudly made in the USA and built to last; this AOG T-Series natural gas grill features commercial grade 304 series stainless steel construction; long-lasting stainless cooking grids and heavy-duty warming rack; and highly-sophisticated stainless steel 32,000 BTU U-shaped burners with integrated support posts for performance and durability. If you enjoy grilling veggies; steaks; and chicken all year long on an incredible grill; the first thing you will appreciate is the brand-new Piezo Rapid Light ignition; firing you up that much quicker with no electricity or batteries. 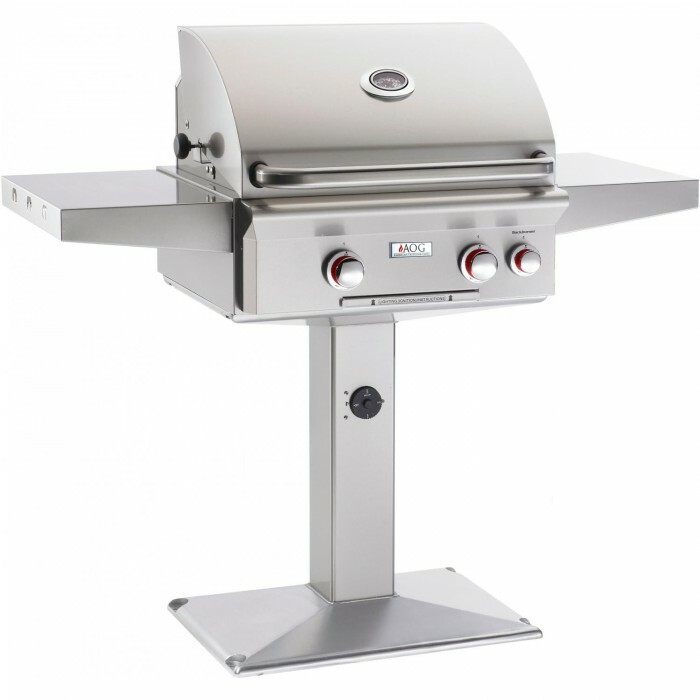 Other great features on this grill include 432 sq inches of primary grilling space; stainless steel vaporizer panels (also called flame tamers) for even heat distribution; solid brass valves with red-flared front knobs for precise temperature control and longer life; and a funneled grease management system with slide-out drip tray for painless clean up. Roast a better bird with the high performance rotisserie kit with 10,000 BTU infrared back burner. Whether you enjoy entertaining the neighbors or rounding up the family for a fresh meal; this AOG 24-inch T-Series gas grill will add style and cooking excellence to compliment your outdoor lifestyle. SHIPS WITH NATURAL GAS ORIFACE. LP ORIFACES INCLUDES. CHANGE OUT SHOULD BE DONE BY A LICENSED CONTRACTOR.